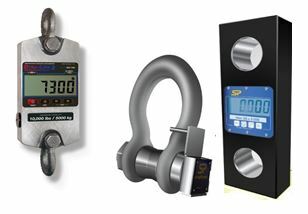 Our range of Tension loadcells (Dynamometers), loadlinks & shackle load cells are simple to install and range from 1t – 250000t. At the core of our product line for over a decade, the cabled and wireless version have surely helped shape the modern load monitoring industry. Manufactured from industry leading G2130 & G2140 Crosby high carbon steel shackles, the product offers reduced overall weight and headroom providing a great fit for low headroom, load monitoring, weighing and force measurement solutions applications. Such applications include tower erectors, utility companies, nuclear facilities and material handlers. To allow easy viewing of the weight display optional hand held devices are available which can be either wired or wireless depending on the application. These also allow the control of all of the functions such as Zero, Tare, Unit selection and Peak hold depending on the model chosen.